Being the Antioch of Asia? It has been reported that Singapore was bestowed the mantle of being the “Antioch of Asia” by the late Billy Graham, 40 years ago during his crusade held in Singapore. A decade later in 1988, Patrick Johnstone, a well-known researcher in his book The Church Is Bigger Than You Think, cited statistics which showed that Singapore was the only nation in the world where “Protestant churches sent out more missionaries than there were congregations”. Using this as a backdrop, Dr W. M. Syn, Director of the Asian mobilisation base of a global mission agency, wrote On Being the Antioch of Asia to turn the spotlight on the ‘elephant in the room’ – the existing relationship between mission agencies and local churches. In an engaging manner, the writer put together the need for both local churches and agencies to review the common mandate given to the Church to be ‘salt and light’ to the world. Dr Syn collected important stories and history, giving readers a bird’s-eye view of the state of affairs in local missions. He also pushed readers to evaluate the state of missions in Singapore, using the “Antioch of Asia” concept to thoroughly examine how far the Singapore Church has progressed in this area, and where we should be heading. Of particular concern to the writer is the increasing penchant for short-term mission trips, often leaping into cross-cultural ministries before developing cultural intelligence, and thus skirting around other very pertinent issues. These are seldom meaningfully dialogued within churches and mission agencies, much less between them. One important aspect which he highlighted for mission agencies’ consideration is their role in sending missionaries to the field. The traditional model is for churches to send missionaries through an agency, but increasingly churches are sending their missionaries directly to the field, citing the benefits of closer church involvement in and stronger ownership of the mission. Providing specific skills to help churches develop their vision and strategy for missions – especially for identified people groups. Equipping potential missionaries with preaching and teaching skills. Understanding the needs and workings of various sending churches, recognising that denominational and independent churches may require different strategies. Developing good missiology and theology of missions, to establish a better understanding of missions in sending churches. Dr Syn’s book courageously invites readers to venture into a ‘new field’ of frank dialogue, analysis, and discernment needed to work together effectively as we face the challenges ahead. I recommend that any individual Christian, church, or mission agency should take time to read this book, and use it as a springboard for working together for the growth of God’s Kingdom. The Rev Dianna Khoo is Area Director for Vietnam, Cambodia, and Thailand with the Methodist Missions Society. She has also been appointed by the Bishop as the Mission Superintendent of Thailand. Rev Khoo is an Elder attached to Barker Road Methodist Church. 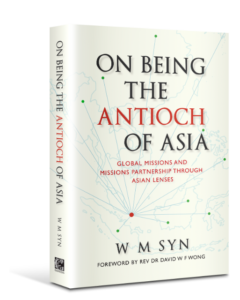 Enjoy 20% discount off the price of On Being the Antioch of Asia when you purchase the book at the Armour Publishing web store! Simply key in the promo code ANTIOCH20 at the checkout page – valid only from 1 – 30 Jun 2018.